Yes, contrary to popular belief there is not a tap ("faucet" if you are American) in the sky which is magically turned off on a certain day. The seasons blur into one another. I have tried to explain before. We do not have a clear cut "wet" and "dry" season. Yes, some months are statistically wetter than others. Unlikely that September will be drier than January... but months like April and November, at the edges of the season can get plenty of rain, even if they are classified as high season. The Phuket rainfall averages show that November is the wettest of the high season months, but with way less rainfall (on average) compared to October. So over the last few days, we have had daily rain, mostly in the evening, though Tuesday it was pretty wet all day. The wind has switched absolutely to the East/North East and has been quite breezy for 2 days, though tonight I feel things have calmed down, and the forecast looks good on Windguru. Over on the east coast of Thailand, the NE winds are a bad thing, as Camille says today in his Koh Samui blog - "Rain's coming down in heaps and nonstop, sometimes it drizzles and sometimes it just pours". November in Samui is like May in Phuket, but as here the rain does not last forever. A couple of photos.. on Saturday we were happy to find that one of our favourite restaurants had reopened (they close in low season). "The Beach Bar" is so quiet and friendly, nicely out of the way, miles from the main beaches. A place I can happily sit for hours. 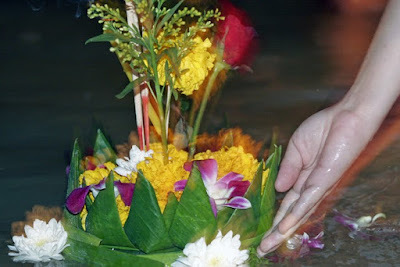 Monday was Loy Krathong - a big festival in some parts of Thailand. Everyone still "does it" in Phuket although it's more important in parts of Northern Thailand. The last few years we have been to Bang Wad reservoir to float our Krathong - see photos from Loy Krathong 2008... but this year, we decided that the Beach Bar was the place to be! Quiet, just a few people. Suits us perfectly. Praying for sunny skies and a trouble free high season - see you in Phuket! If you are reading this and have not yet booked a hotel - I suggest looking at Agoda.com - hotels in Phuket, Bangkok and all over Thailand. Cheers!